For the longest time, I didn't really "get" the whole Frozen phenomenon...because I had never seen the film. 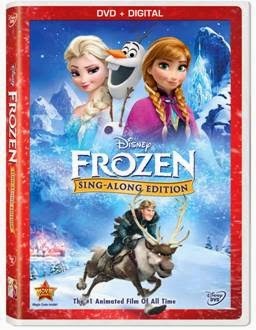 Now that Hannah and I have watched the Frozen Sing-Along Edition DVD, I get it (not that I'll be getting into any fights for swag...yet.) If you've never seen it, Frozen is the story of two Royal sisters. You join Princess Anna as she sets off on an epic journey – teaming up with rugged mountain man Kristoff, his reindeer Sven and a snowman named Olaf – to find her sister Queen Elsa, whose icy powers have trapped the kingdom of Arendelle in eternal winter. The story of Frozen is one Disney tale I am happy for my daughter to grow up with. After watching the film, my girl crush on Kristen Bell (who voices Princess Anna) grew even bigger...and then I watched some YouTube interviews with her about the film and realized why I liked Anna so much. Bell basically wanted to voice a character (and can she ever sing!) that was not perfect - someone who was dorky, klutzy and spoke too much...someone she could have related to as a child, and I definitely could have too. I'm happy Hannah will have a dorky princess to look up to - a princess who cares more about her sister than finding Prince Charming. The movie is everything you expect from Disney and a little more. Great songs, great imagery and great lessons. The Sing-Along Edition has handy lyrics on the screen with a bouncing snowflake. And you'll need them, because hours and days later you will want to sing the correct lyrics when the songs refuse to leave your head. This is one DVD I hope never gets scratched! Do you love the songs from Frozen?